Six inches long. Black bill, eyes and forehead extending up to a conspicuous pointed crest. Ashen-gray upper parts. Gray wings and tail. Dull white sides of head, white under parts and faint orange under wings. A year around resident in forests and groves throughout most of the eastern U.S. from the Gulf States up to Michigan, the Great Lakes region and over to Main. Tufted titmice forage for insects, nuts, berries, and seeds. They are cautious at feeders usually taking seeds and returning for more after eaten. Similar inquisitive and acrobatic habits to those of the Chickadees. Not a shy bird; it may be approached with ease. 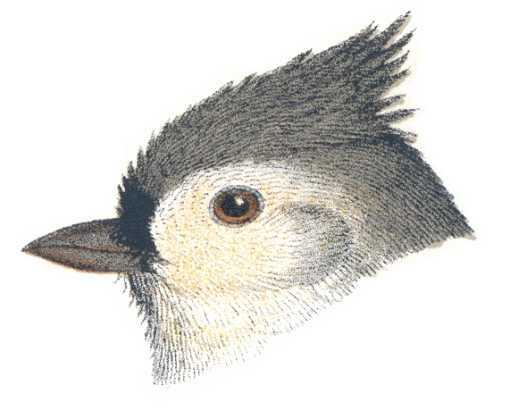 According to Neltje Blanchan, a titmouse’s two tiresome notes sung for hours drove the musician Schumann mad. Builds nests of leaves, moss, feathers, fibrous bark strips and cattle hair usually in natural or abandoned cavities in stumps or trees and correctly sized and mounted bird houses in their common habitats. Females lay five to eight white speckled eggs. Young hatch after about two weeks of incubation. Fledglings leave the nest in about another three weeks. The tufted titmouse birdhouse is the same as for white and red-breasted nuthatches, plain titmice and chickadees. Make a 4″ by 4″ floor and a 9″ inside floor to ceiling height. Drill a 1 1/4″ diameter entrance hole located 7″ above the floor. Cut or drill ventilation openings in the floor and under the roof. Secure a hinged roof secured with shutter hooks. Assemble with corrosion resistant screws fit to pre-drilled pilot holes. Install nest boxes for tufted titmice in forests or groves on a tree trunk from chest level to just out of reach, higher if necessary. Place a few chips on the nest box floor. Chickadees and nuthatches may use this nest box. Remove the nest from the box after the brood rearing season is past. 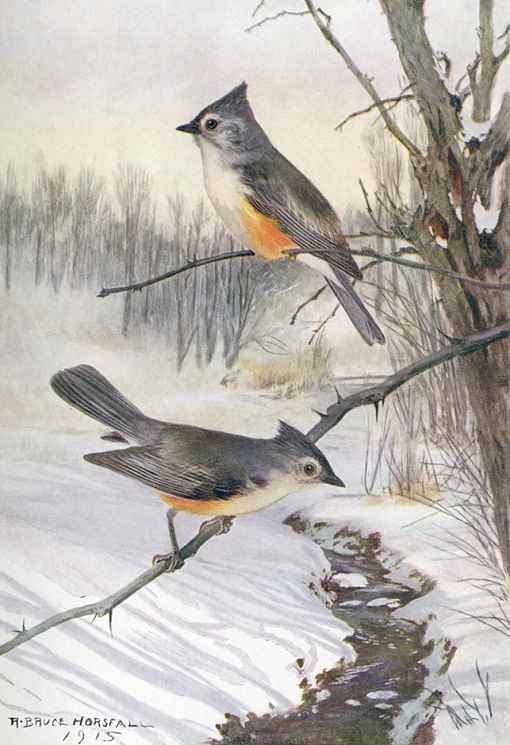 If you mount a Winter Warmer and occasionally lift the lid in cold weather, you may see several cuddling titmice and possibly with chickadees and nuthatches. Six inches long. Black bill, eyes and forehead extending up to a conspicuous pointed crest. Ashen-gray upper parts. Gray wings and tail. Dull white sides of head, white under parts and faint orange under wings. Lays five to eight white speckled eggs, which hatch after about two weeks of incubation and young leave the nest in about another three weeks. Forages for insects, nuts, berries, and seeds. Cautious at feeders usually taking seeds and returning for more after eaten. Not a shy bird; it may be approached with ease. Similar inquisitive and acrobatic habits to those of the Chickadees. Make a 4″ by 4″ floor and a 9″ inside floor to ceiling height. Drill a 1 1/4″ diameter entrance hole located 7″ above the floor. Cut or drill ventilation openings in the floor and under the roof. Assemble with screws fit to pre-drilled pilot holes. Secure a hinged roof secured with shutter hooks. Mount nest boxes for tufted titmice in forests or groves on tree trunks from chest level to just out of reach, higher if necessary. Remove the nest after the brood rearing seasons are over. Chickadees and nuthatches may use this nest box.